Crew member Veronica Atlantis also blogs about stuff. See her views about Sunday here. The trip started with a rare sighting when, thanks to LD and Veronica, we spotted a seal in the river just west of the Gloucester Marina. It looked like a young one and was just resting and floating along on the current. Although the north side of the island was flat calm when we drove around to check, it had developed a north wind by the time we exited the Annisquam River into Essex Bay. 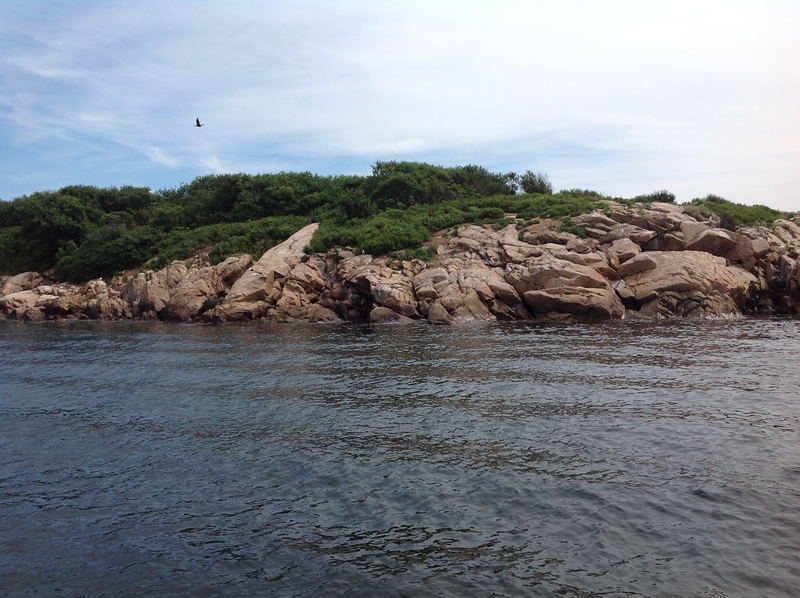 Our first choice of dive site, S & M just outside Plum Cove, looked too exposed if the wind were to freshen. So I motored on a bit and chose the area between Tide Rock and the Seaside Cemetery at the north end of Lanesville Shores. It was almost dead low tide and, as a result, the visibility was not good today – about 10 feet. But the water was between 59 and 61 degrees, depending on whether you were out to the mud/sand edge in 45 feet or not. Those of us who stayed around the boat in about 20 feet were the warmest. We had Jacky K., Sandy M., LD and ZT on board with Pete and Veronica as crew. The Captain got wet and I worked with ZT on basic skills for her Dive Patrol open water scuba diver rank. She did great with all of them, plus a few extras like several back rolls from a low gunwhale and getting back into the boat when your tank has almost slipped out of your BC. Sandy M. had a close, fun encounter with masses of cunner and a school of about twenty good-sized pollack. She described the cunner as being curious and looking right into her mask until she exhaled and they all took off. The weather couldn’t have been nicer with a cool breeze and full sun. Hope we have lots more of these before the season comes to a close. We had a flat, calm, almost windless day – a rarity. We could have gone anywhere. I chose Thacher’s Island off Rockport’s Loblolly Cove in the hopes we’d get clear, warm water. Well, one out of two isn’t bad. The tide was going out as we cleared the Blynman Canal’s bridge. They didn’t even have to raise it for us because we could fit if we took down our antennas, so we did. After a short stop at Norman’s Woe rock for a quick picture, we motored up the Back Shore, past Good Harbor Beach and Milk Island to Thacher’s. We had LD and Alan Hicks with Pat as crew. I was planning on videoing and The Captain directed traffic. The ocean was slick and slippery with no wind to rough it up. I anchored in about 20 feet at the base of the non-working lighthouse on the island. The water was cold (in the upper 50s) as it gushed into the gaps in my Mares wetsuit. My hood has torn and lets water in easily. My neck seal has a large hole right below my Adam’s apple from a fingernail puncturing the neoprene. The seam at the base of the back of my neck is gaping open these days. I wore a steel 72 and my regular weight belt and was a little heavy at the deeper places I visited. Lots of ocean needed to be warmed up as it sloshed around inside the suit. Nevertheless, I found some cunner feasting on the remains of barnacles that had been inadvertently broken by our downline. The tide was just turning as I surfaced for a warm up. We decided to stay where we were for the second dive. I surfaced with about 1500 psi in my tank because I was getting cold. The incoming tide was much colder but the water was also much clearer because of it. We hosed down with the sun shower fresh water and I drove back into the afternoon sun. It was hazy and a tiny breeze was coaxing the Ardelle and the Lannon with their sails almost slack. Again, we slipped through the bridge without having to have it raised because the tide wasn’t very high yet. The Cape Ann Marina’s tuna tournament was in full swing as we docked. Lots of extra cars and music and noise from the south side of the parking lot. Good for them. I think we had more fun than they did and nothing died to provide it. Here’s a link to Veronica’s blog and her version of what happened yesterday. Notice how the rocks extend all the way into the water? That’s one of the reasons this place is so pretty. The boulders and canyons continue on underwater. The winner today was Veronica who found Dean’s red net bag during the first part of her dive. It was open and empty on the bottom, she said. Dean had indicated that it would probably be open because he hadn’t clipped it shut before he fastened it to his vest. Then it came unfastened yesterday and he lost it. 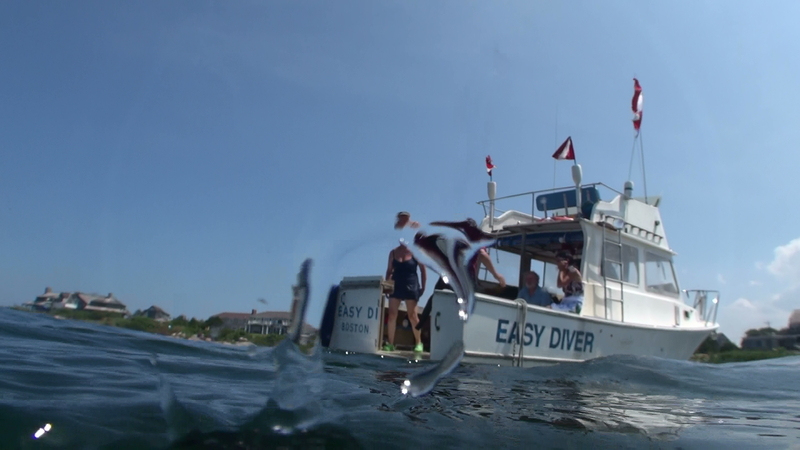 Now it’s safely aboard Easy Diver, ready and waiting for Dean’s next trip with us. 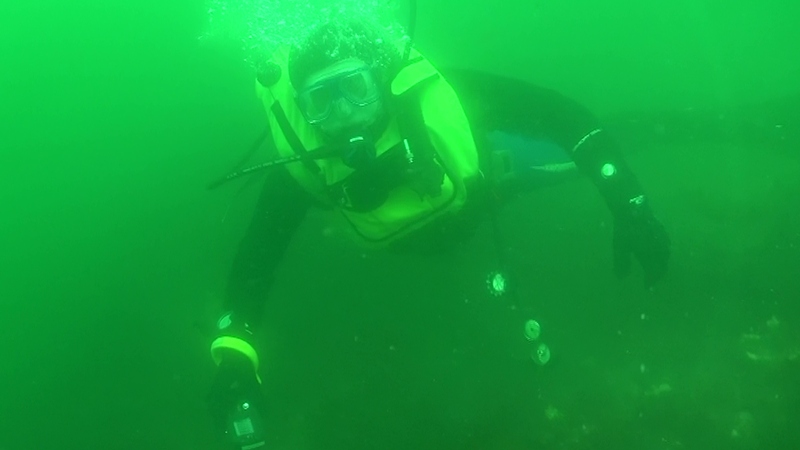 Peter reported that the water temp was in the high 50’s and the visibility was 10-15 feet. Then Linda M. surfaced with a large strobe arm for a camera. It had been down a long time, so we didn’t keep it. Finally, Veronica swam back to the boat to report she’d seen a huge torpedo ray up close and very personal. What a trip! Since Myanna’s back was bothering her, she doffed her tank and we pushed/pulled it into the inflatable so she could float back to the big boat in comfort. The second dive site was over on the mainland at Saddle Rock. It’s just off the coast of Coolidge Point in Manchester-by-the-Sea and since it was almost high tide, the rock was awash. Myanna rested while Pete and Linda looked for lobsters. There were plenty walking around, but none were legal sized. The visibility was a little worse here at 10 feet, but it was warmer at about 59 degrees. Linda M. took a long looping course to view the sights. Although she started with current, it had slackened a lot at high tide, so her trip back to the swim platform was an easy one. I munched down two of V’s spinach pita sandwiches, an apple and a V-8 that she brought to share. Ambrosia! The trip back into the marina was exciting because of the outgoing tide at the Blynman Bridge. Hootin’ and hollerin’ greeted Lynn and Phil on their balcony overlooking the river. I was relieved that we hadn’t struck the bridge supports as we tooled through at max rpms. Then I had to back down the opening at J dock while avoiding visiting firemen and the afternoon tour flat boat, Anni, to ease into our slip with a north wind. Thanks to Pete and The Captain, I did it with no bumps or scrapes. Huzzah! It was a fine day with good people. It was drippy and drizzling this morning, but the weatherman said it would clear up gradually during the course of the day. Yeah, right. We had IT, Dean, Dave and Ken along with Pete and Pat as crew. The Captain stayed as dry as possible, but like the rest of the crew, developed swamp a** over the course of the trip. If you don’t put on a suit, and it’s rainy, you’re going to sit in a puddle on the gunwhale – guaranteed. 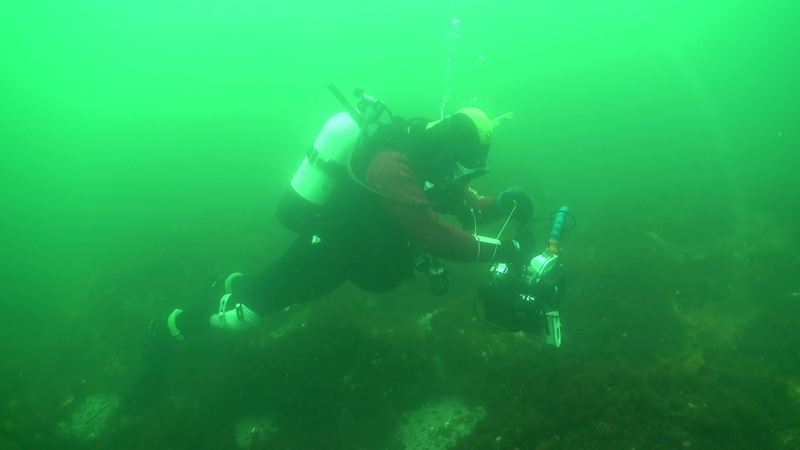 We learned that the visibility was about 10-15 feet with a water temperature of 52 degrees on the bottom and 57 degrees half-way up to the surface. There were huge boulders and cuts that could have trapped the bag, so it was no surprise that they couldn’t find it. Everyone seemed happy to have been able to get wet on such a gloomy Saturday. Today was supposed to be cloudy with showers and thunderstorms. Maybe that was happening somewhere in New England, but we had sun and clouds with no wind. Several weatherwise folk joined us today: Kevin and Linsley Mordasky, Kerry and Linda Hurd and LD. We had Pete (on his birthday) and Pat as crew. The Captain set the pace. Since what wind was due was supposed to come from the south, we went north and over the top of Cape Ann to Rockport’s Gap Cove for the first dive. After last night’s heavy rains, we weren’t expecting much in the way of visibility, but it was OK at 15-20 feet over the sandy patches. Pete reported that it was 57 degrees all the way to the bottom at 21 feet. The rest of us cruised around the area, marveling at the huge boulders that dotted the landscape. LD found a wall with lots of rusty machinery near the gap between the mainland and Straitsmouth Island to the east. 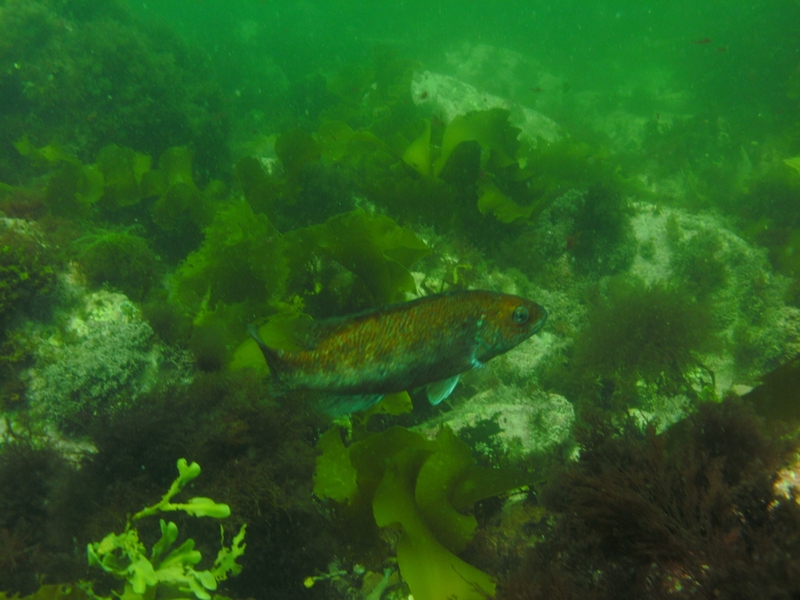 For the second dive, we moved seaward to the island’s small north facing cove. As I was settling in for an anchoring, Pat loudly recommended we not pick this very spot. She could see the top of a submerged rock just off the starboard side. So-o-o. We moved east a couple of boat lengths. I was later able to explore the crag and its cleft which was enormous, but weedy on the bottom. In fact, lots of the low lying crevasses were filled with loose, floating brown sea weed. It mucked up the video shots we tried to take of the landscape and its terrain. LD noted that the viz hasn’t been that great since early spring when we were filming nudibranchs. I guess the water’s just too warm and it fosters lots of weed growth. 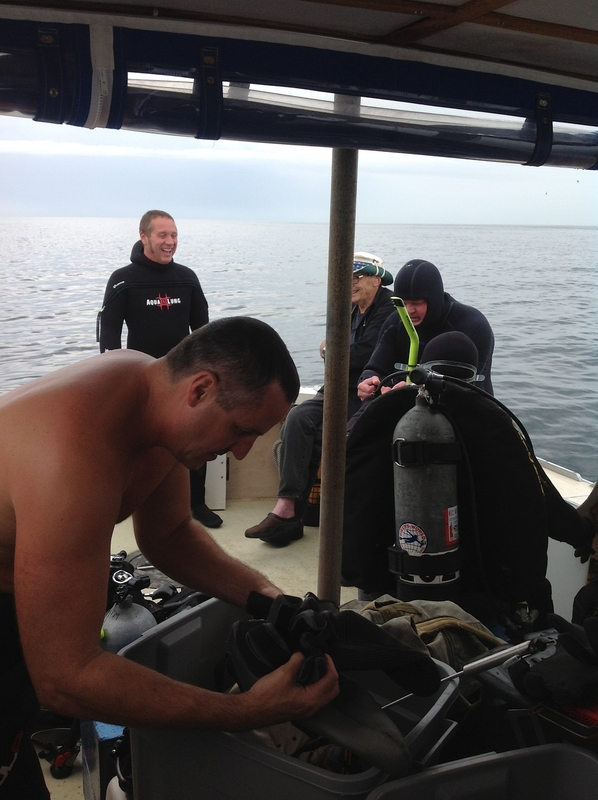 I drained my tank on the second dive and headed up to join the others who were already on board. Everyone was eager to get back to the Halibut Point restaurant for Pete’s “surprise” BD lunch. 9 hungry divers were happy to fete him on this special day. We had even more sun today. I’m crispy. We had ZT again, so went to a scenic, easy place for her second and third dives. We picked Gully Cove near the gap between Rockport’s Gap Head and Straitsmouth Island. It was about 25 feet deep. After her first giant stride entry, she managed the down line just fine. On the bottom, with Pete’s assistance, she caught her first legal-sized lobster. We also had LD, Gary from Northshore Frogmen, and Jacki K with Pete and Veronica Atlantis as crew. The Captain kept his cool. This cove is neat because there are sandy patches between boulders and rocky outcrops. It had lots of critters to see and denizens for the hunters. The water was in the low 50s on the bottom with great visibility – 20 to 25 feet. On the surface, the water was in the high 50s due to the south wind that was pushing all the warm surface water out to sea. Veronica, ZT and I made a trek to the shallows to experience the difference in temperature first hand. It was much more comfortable in about 15 feet of water, but the visibility declined to about 10 – 15 feet. The boulders were golden here with Irish Moss. We saw two divers entering the cove from shore. They swam straight out into the “shipping lane” and 50 feet of water, missing all the good stuff we were seeing. We spent both dives at this place, mostly because the visibility was so good on the bottom. It’s the best it’s been for several weeks. After a long trip down the river to home behind a TowBoatUS with a client strapped to his side, we agreed that high tide at the end of the dive is the best there is. Who needs a scuba sherpa when the ramp is flat? Hazy, hot and humid weather with only a hint of a breeze means high summer in Cape Ann. Today was a prime example. The rest of us geared up quickly to escape the blistering heat on deck. We were anchored just below the dead light at Thacher Island in about 25 feet of water. Pete explored on his scooter and went to 42 feet where it was 52 degrees. On the surface, it was 57 degrees as the tide came in. Visibility was mixed between 10 and 15 feet. There was a lot of loose, floating sea weed and deep places between boulders were filled with a floating mass that made hunting hard. Nevertheless, Pete found lobsters confronting each other out in the open and was amazed at their actions. I saw one or two lonely pollack and last year’s cunners under rocks with newer ones. There was one overhead area where filtered sunlight was shimmering on the bottom and breaking up when ripples passed overhead. It looked like someone was playing with a pocket mirror to catch my attention. Richard snorkeled overhead as I made my way into a more sheltered cove to see how warm the water would get. It was a twisty, turny entrance and the colors got brighter as I got closer to shore. The slope was brilliant yellow with Irish Moss. Floaters of sea gull feathers attested to the island’s major inhabitants’ molting status. The cove had visibility of 20 feet and the water was WARM. My hands were not even feeling the cold at all. Unfortunately, my video camera wouldn’t let me record. I depressed the appropriate lever, but it stayed in stand by mode and wouldn’t budge. Dang. I employed the universal reboot mechanism and turned it off and back on. Still no recording. Double dang. After I swam back to the boat to see if Pat or The Captain could figure what was wrong, I learned that the two D’s had lost a camera on their dive. I went back down to look for it until my air was gone. When I returned to the swim platform, they had changed tanks and gone back in themselves. By default, we decided to make both dives in the same place. It wasn’t long before they surfaced to report success – a true search and recovery. It was a hot ride back to the marina, but it was high tide, so the gear practically loaded itself into the truck.